Awesomenauts Assemble PS4 Update 1.4 Coming next week! While we’re busy improving the Steam version of Awesomenauts, our friends at Abstraction are hard at work bringing those improvements over to console. 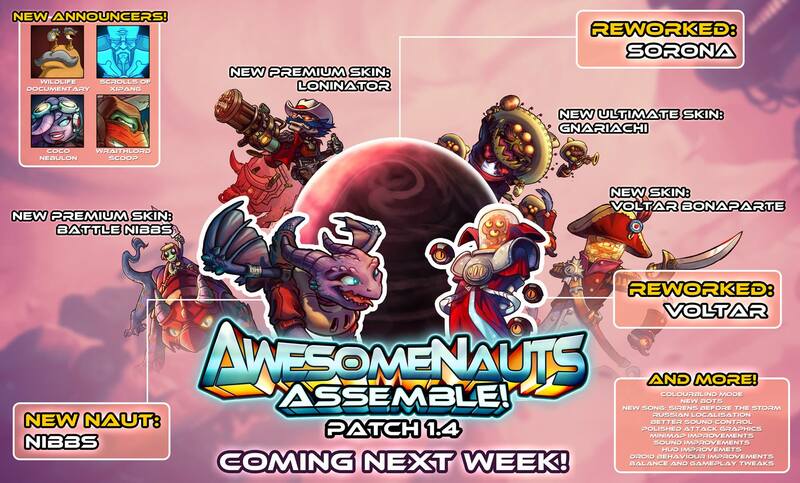 This work is paying off as next week Awesomenauts Assemble will be updated to version 1.4! Version 1.4 is the biggest update for Awesomenauts Assemble ever, bringing a new Naut, Sorona and Voltar reworks and lots of fixes and tweaks! Some of the improvements include a new song, new attack graphics and new bot AI. The update will be live August 26th so get ready!